Stormtroopin off-road... if only it weren’t for those damn Ewoks! I previously wrote about seeking out a XJ Cherokee. It has not gone well. All the nice ones are gone! Or they are astronomically expensive. I will not pay 4Runner money for a XJ. I won’t. I won’t. Don’t encourage my bad habits. I’ve decided a 4Runner is a far better option. Except I’m running into a similar problem. The boat hasn’t sailed, it simply hasn’t come ashore yet. The problem is that any 4Runner is typically used up, worn out, and put away wet. They all seem to have high miles, body damage, dirty upholstery, and have been off-road too much. If all these things aren’t present, any 4Runner is close to 20 grand... for something 15 years old. 2006 Toyota 4Runner 2wd with 250k miles. Goes great off-road! You don’t need 4wd, this thing does fine. Check out my sick pics of me flexing on the mall loading dock. Oh and don’t worry about that noise coming from the suspension. It’s normal to hear a clunk. Timing belt? I’ve never replaced it as I have no idea that my V8 has one. Asking 17,000! This deal won’t last! 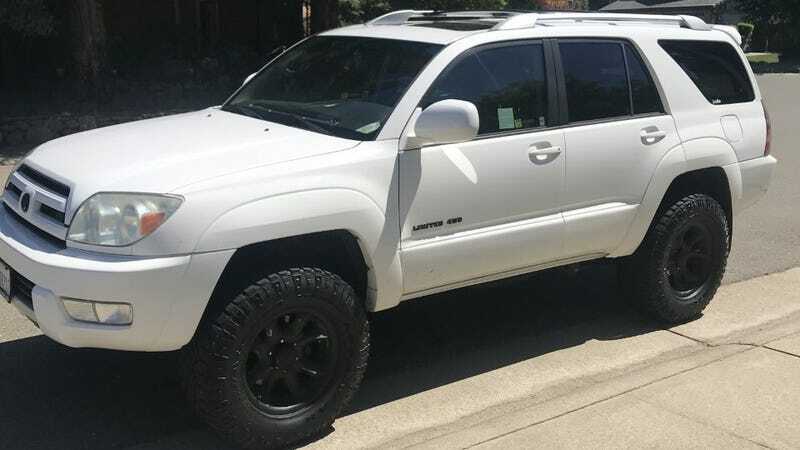 The current potential candidate (pictured above) is a 2004 Toyota 4Runner Limited 4.7 V8. It has 138,000 miles with a 4 inch lift and 33" tires. The owner is asking $12,000. Having looked quite a bit in the last month, this appears to be a good deal. Or at least lower than most are asking. Or maybe I drank the coo-laid? Now I’m not against getting the 4.0-V6, but there is something so much more satisfying about getting the V8. I don’t think they’ll ever offer another V8 4Runner. This was the only generation to get it. The V8 is also all time 4wd... so no messing about with switches. Run-over what you want, when you want, without stopping to turn the 4wd selector. The V8 requires a timing belt vs. the V6 with a timing chain. It also gets worse gas mileage. The power and torque are moderately better but I won’t call the V6 under-powered comparatively. I’m not building this argument very well, I see your discontent. How bout this; more cylinders = more fun? If I can’t find a cheap 4Runner, I might wait a year and buy a new one. These things hold their value... I mean I could drive a vehicle for 15 years over every pot and mud hole in my area and still get 1/3 of its value back? How isn’t that an amazing deal? !